While Landslide Communication’s slates are targeted to include moderate and conservative voters regardless of party affiliation, including independents and “Decline-to-State” voters, “hard-core” self-identified Republican voters remain a very important part of our overall direct-mail program. And as the saying goes, “all politics is local.” GOP voters are dominant in the local southern California counties of Orange County, San Diego County, San Bernardino County, Los Angeles County, Riverside County and Ventura County, and are the most important in the State of California for Republican candidates and statewide measures that are counting on support from their Republican base. In these days of low-voter turnout, inexpensive and persuasive direct-voter contact like Landslide’s “Republican Leadership series” to help inspire higher GOP voter turnout are now an even more essential part of a winning campaign strategy. Orange, San Diego, San Bernardino, Los Angeles, Riverside and Ventura County Republican voters are simply essential to help pile up the votes to assure a statewide victory for a pro-business initiative or a moderate/conservative candidate. Our “Republican Leadership series” of slates are all locally branded by county. 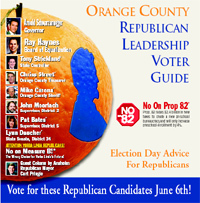 Orange County Republican Leadership Voter Guide (OCRLVG) is a very credible tool to help roll up those big Republican victories with votes from Orange County. First successfully launched in June of 2006, OCRLVG captures every pure Republican high propensity household — all 200,000 + of them — in Orange County. Every effort is taken to assure that OCRLVG has high credibility with Orange County Republican voters. Top county Republicans, such as popular elected officials and the late former Orange County GOP Chairman Tom Fuentes, have provided useful newsletter copy on GOP party-building for our past mailings. Color pictures and generous text messages are afforded to local candidates. Multiple icons, pictures and messages are provided to statewide candidates and measures throughout the mailing. The slate welcomes advertising from the business-friendly position on county and statewide measures. 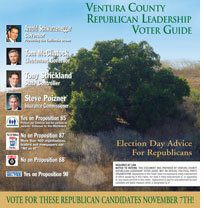 In November, 2006, sister slates, namely, San Diego County Republican Leadership Voter Guide, and Ventura County Republican Leadership Voter Guide, were successfully launched, using similar formats and local GOP credibility builders, just like our Orange County slate. 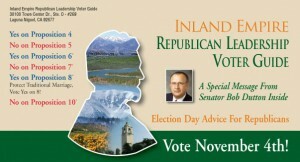 And in 2008, we successfully launched San Bernardino County Republican Leadership Voter Guide and Los Angeles County Republican Leadership Voter Guide with the support of local Republicans, and in 2010 we added Riverside County, consolidating it with San Bernardino into one “Inland Empire Republican Leadership Voter Guide.” The power of Republican voters in Orange, San Diego, San Bernardino, Los Angeles, Riverside and Ventura Counties can make or break statewide elections, and these GOP slates are an important part of our integrated program! If you want to help build a big vote in Orange, San Diego, San Bernardino, Los Angeles, Riverside and Ventura Counties, you need to be on our Landslide Communicatiosn slate program!